R&D Dynamics supplies FAA (Federal Aviation Administration) approved PMA parts for high speed turbomachinery, including air cycle machines (ACM’s) and gas turbine aircraft engine starters; both air bearing supported machines and machines with conventional, oil-lubricated ball bearings. 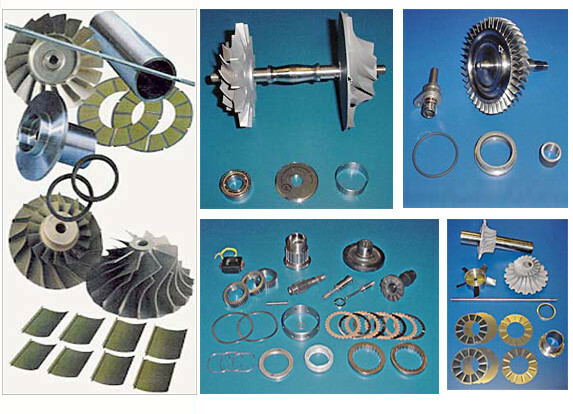 R&D supplies all critical ACM and starter parts, including bearings, shafts, seals, engine starter jaws, centrifugal compressor impellers and diffusers, radial-inflow turbine impellers and nozzles, and integrally bladed axial fan rotors. R&D Dynamics Corporation is ISO 9001:2000 / AS9100 registered, and an FAA approved PMA parts manufacturer. Most production, including foil bearing manufacturing and testing, 5-axis blade and vane machining, rotor and shaft balancing is done in-house. Special operations, such as coating, plating and heat treating, are performed by a trusted network of approved and certified suppliers. All bearings and rotors are tested prior to shipment. Examples of PMA parts are shown. PMA Listings: PMA Parts or by Summary of Supplement.